Heart shaped pendants, including Past Matron's pendant. Each comes on 18" chain. Available in Sterling Silver or Gold Filled. Lovely heart shaped pendant and earrings with OES emblem. Earrings available pierced or non-pierced. Select items separately when ordering. A beautiful collection of OES jewelry featuring colored stones in the shape of the OES star. Earrings available peirced and non-pierced. Pin:$18.95 Bracelet:$90.75 Earrings:$56.95 Necklace:$119.75 Order items separately. Beautiful 'snowflake' style jewelry items with OES emblem in center. Order items separately. Earrings available pierced or non-pierced. Available with OES or Shrine emblem. Choose Gold or silver. Order items separately. Earrings are available pierced or non-pierced. OES emblem surrounded by brilliant stones. Earrings available pierced or non-pierced style. Order items separately. Oval OES pendant and round Past Matron's pendant with decorative edges. Each comes on 18" chain. Available in Sterling Silver or Gold Filled. 28 fine diamonds in this bumblebee design. Also available without emblem for $1095.00. May be ordered in yellow or white gold. Choose diamond or colored stone star points. Available with or without gavel. Other fraternal emblems are available; call for price. Plum color Bow with white stone Star in center. 42 fine diamonds. 2.5mm solid rope chain with barrel clasp. May be ordered in yellow or white gold. Choose diamond or colored stone star points. Available with or without gavel. Other fraternal emblems available; call for price. Two different styles of Past Matron charms/pendants. Also available without gavel for members. Each comes with one fine diamond and may be engraved for $0.35 per character. May be ordered in yellow or white gold. Choose diamond or colored stone star points. Other fraternal emblems are available; call for price. Beautiful diamond heart Past Matron Necklace. Also available without gavel for members. Set with 23 fine diamonds weighing approx. .35cts total weight. 18" fine rope chain. May be ordered in yellow or white gold. Choose diamond or colored stone star points. Filagree heart shadow box design. Past Matron emblem set with 7 fine diamonds weighing a total of .25cts. May be ordered in yellow or white gold. Choose diamond or colored stone star points. With or without gavel. 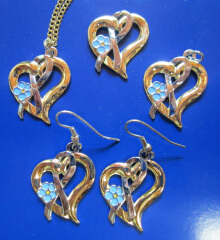 Gold finish Open Heart with Silver finish Awareness Ribbon entwined and a Blue Forget-me-not. 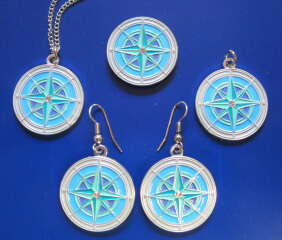 Silver finish Compass with shades of Blue and Green. White Stone in center. Diamond heart necklace. COmbination 14kt white & yellow gold. 28 fine diamonds. Available with or without gavel. Star points may be either diamonds or colored stones. Freeform design. 12 fine diamonds. May be ordered in yellow or white gold. Choose diamond or colored stone star points. With or without gavel. 12 fine diamonds. May be ordered in yellow or white gold. Choose diamond or colored stone star points. With or without gavel. 14kt Past Matron shadow box. Also available without gavel for members. 10 fine diamonds. May be ordered in yellow or white gold. Also available with colored stone star points. Freeform design. Three fine diamonds. May be ordered in yellow or white gold. Choose diamond or colored stone star points. Available with or without gavel. Other fraternal emblems are available; call for price. Nugget design. May be ordered in yellow or white gold. Choose diamond-$1345.00 or colored stone-$1195.00 star points. Available with or without gavel. Other fraternal emblems are available; call for price. 15 fine diamonds. May be ordered in yellow or white gold. Choose diamond or colored stone star points. Available with or without gavel. Other fraternal emblems are available; call for price. 7 fine diamonds. Also available with diamond star points for $995.00. May be ordered in yellow or white gold. Available with or without gavel. Other fraternal emblems are available; call for price. Basket design with 8 diamonds. Genuine citrine, sapphire, amethyst, ruby, emerald & peridot. May be ordered in yellow or white gold. Choose diamond or colored stone star points. Available with or without gavel. Other fraternal emblems are available; call for price. Two sizes of the same design. May be ordered in yellow or white gold. Choose diamond or colored stone star points. With or without gavel. Beautiful swan with 40 fine diamonds. Sapphire eye. May be ordered in yellow or white gold. Choose diamond or colored stone star points. Available with or without gavel. Other fraternal emblems available; call for price. Swan with 9 5 diamonds and emerald eye. May be ordered in yellow or white gold. Choose diamond or colored stone star points. Available with or without gavel. Other fraternal emblems available; call for price. Gold finish heart shape pendant with OES emblem and brilliant white rhinestones. Beaded cord for badges. 36" gold link & pearl chain. 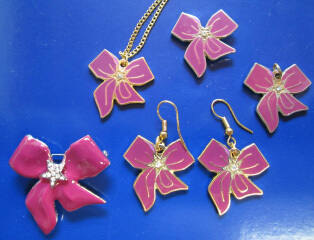 Beautiful pendant and earrings. Available in gold or silver, with OES or Shrine emblem. Choose pierced or non-pierced earrings. Order items separately.